This amazing popcorn popper is made of 300 series premium non-stick Stainless Steel which resists corrosion, handles high temperatures and is easy to maintain. The stainless steel pan has an impact resistant bottom with a 2.5 mm aluminum disc ideal for even heat distribution. It includes a vented tempered glass lid with cast handle bracket. Includes the custom crook shaped silicone lid handle cover which allows you to place the lid upright to keep counters clean. The stirring mechanism is interchangeable. Use the floating stir rod to make delicious homemade popcorn and the paddle for roasting nuts and ooey gooey delicious treats. 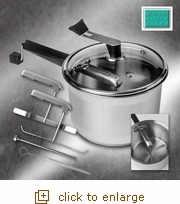 Also includes the insert to transform the popper into a regular stove top pan. The final accessory included is the cleaning brush. Use the cleaning brush to clean out the inside of the pot's handle. This popper is induction compatible.